Here we are opening a new web page for the Battle of Borodino and 1812 campaign. We have many photos of the reenactment that took place on Sept. 5th 1999 and are showing 11 of them here. Our correspondent didn't get photos of the infantry, but these views of cavalry action should be of interest to cavalrymen. 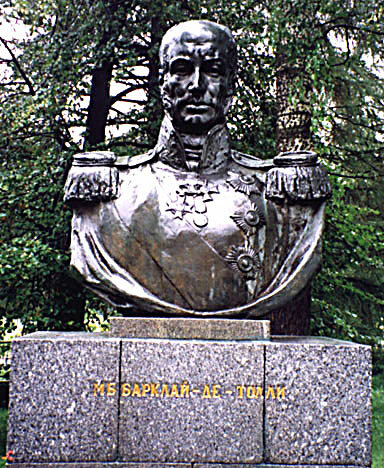 Above are the busts of the Russian commanders of the Second West Army, Prince Bagration; and of the First West Army, Barclay de Tolly. Note that, contrary to the policy of the U.S. National Park Service, in Russia they enact the battle right on the original battlefield. Calvary in action - nuclear weapon?? 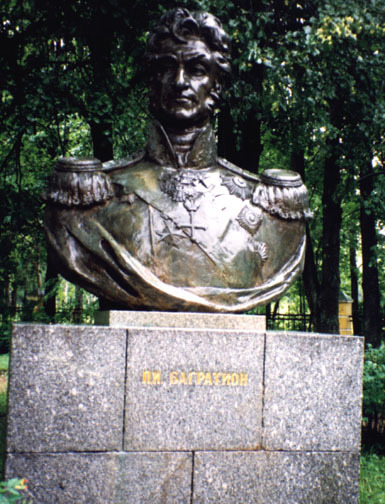 For information on the entire Campaign in Russia during 1812 go here. Return to Xenophon main page. Return to Rushistory main page. Visit the Museum of Artillery in St Petersburg.